One of the many controversies in the field of cardiopulmonary bypass (CPB) that has not been satisfactorily resolved is the good governance of fluid homeostasis. With the initiation of CPB, an extra void is added to the intravascular space by connecting arterial and venous vascular trees to an ex vivo machinery including plastic tubing, filters, pumps, and an artificial lung. This expansion requires an appropriate solution to fill the extracorporeal circuit. During CPB microvascular permeability can also be affected with an expansion of the interstitial space. This depends on the degree of venous back-pressure, lymphatic circulation, and plasma colloid osmotic pressure (COP). In the early days of cardiac surgery hemodilution was first seen as an undesirable side effect . 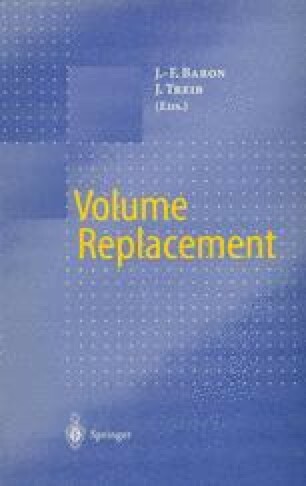 With the improvement of the oxygenators, the priming volume increased and the use of blood substitutes became unavoidable . Hemodilution soon proved to be effective in preventing the “homologous blood syndrome” and renal problems [15, 70]. Depending on their specific composition, rehydration and replacement solutions can be used for the treatment (restorative or corrective) of different fluid spaces .